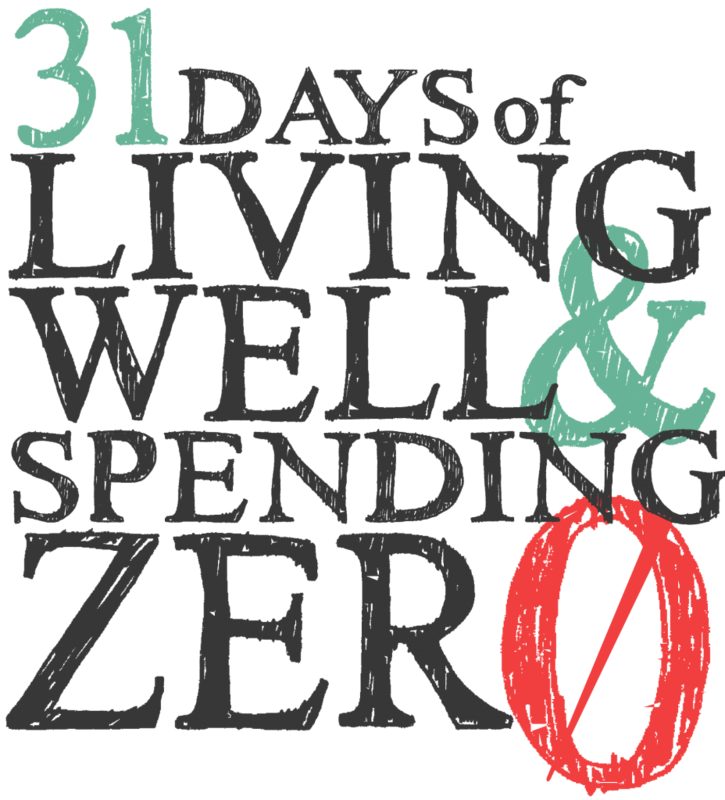 Join Us for 31 Days of Living Well & Spending Zero! Luckily you don’t have to. Over the past four years, more than 100,000 LWSL readers have taken our 31 Days of Living Well & Spending Zero challenge (many of them more than once), with incredible results. In fact, you can see the tangible results of their success by checking out our #31dayLWSZ hashtag on Instagram! 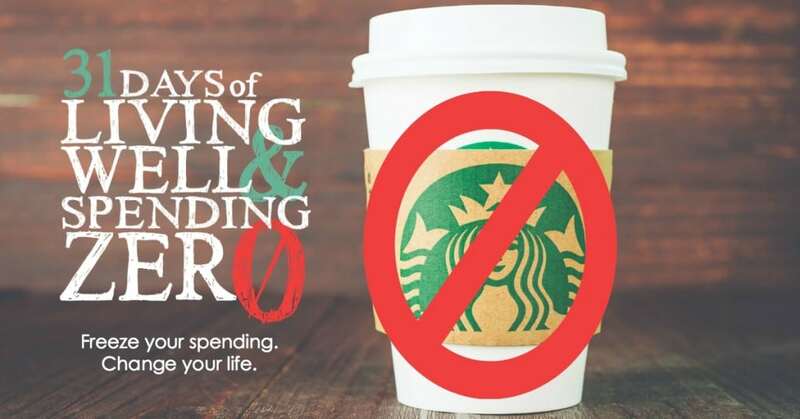 While we occasionally offer the challenge via email, the 31 Days of Living Well & Spending Zero challenge is currently available only in Paperback or Kindle format. 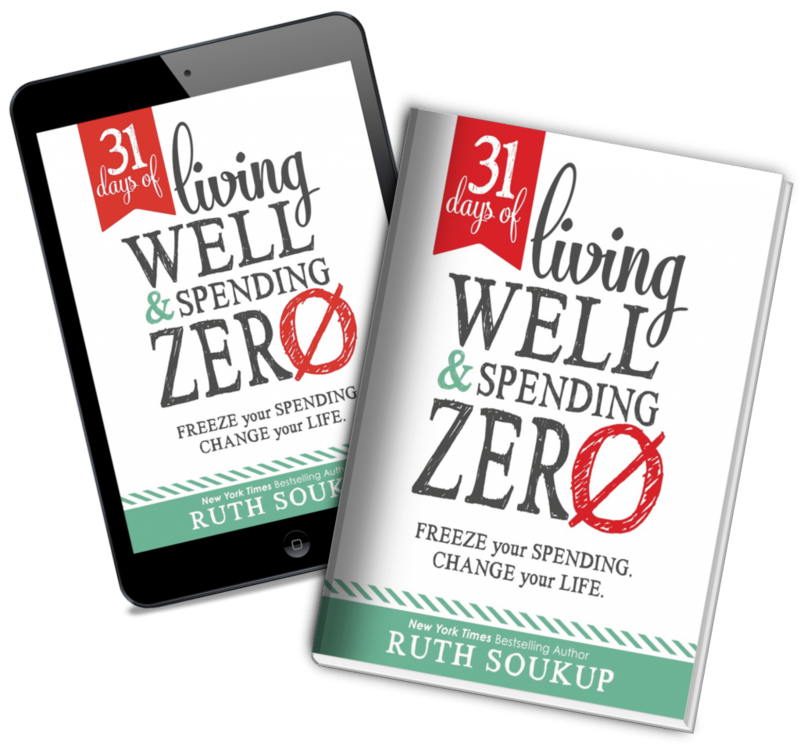 To get the most out of your challenge, and to connect with others who are participating, be sure to follow @RuthSoukup and share photos of zero spending moments on Instagram using hashtag #31DaysLWSZ. It sounds interesting, and probably useful for where my family is. But I am curious how things like perishable groceries (milk, produce) and gasoline are handled. I don’t think one tank would get us through a whole month! I think it comes down more to budgeting. Of course it is IMPOSSIBLE to spend literally $0, but if you can budget for groceries and not go over the budget, seems like that would be a success to me. I consider groceries to be a “bill” anyways! I have done this several times before. It gets easier each time because you know what to do and not to do. You budget for the month. Pay bills, gas for car and food that is a necessity. If I do this right this time I will SAVE over $1000 in October. Just in time for the Christmas season. My plan is $25 a week for food….for milk, bread and such. I am going to spend all $100 for the month. If I have left over I will do stock ups on meat if I find it on sale and freeze it but other than that we are pantry/fridge/freezer eating. I also budged $30 for gas. I usually use $50 per month but I am also not going to be doing any running around either. You can do it and you will be amazed at how much money you save. There’s no way I can do $30 a month for gas. It takes that much a week minimum! I only work outside the home 3 days a week. I also have a fairly fuel efficient car so that is a minimalist type budget for me for ONE month. We usually do 35$ a month for fuel, because we have an energy efficient car and we often do a lot of our errands when it is on our way. We never go to the groceries several times a week — only twice a month! It saves a lot on gas. I like your small budget for gas. I am going to try walking to work as much as possible to help keep my budget small. Of course, I plan to drive when it’s raining! I signed up! I am excited as this will be my first 31 day challenge, ever! Is this going to have the same steps that you have on your blog? Id like to start this month (our $$$ can’t wait!). I’m on disability. I have a mortgage, huge medical bills and living expenses that cannot be reduced I.e. utilities. This makes me want to cry since I will NEVER be able to go on a vacation or even buy Christmas presents. I know how you feel. I was hit by a drunk driver 15 years ago and have been unable to work since then. My husband makes just enough we don’t qualify for assistance but it’s not enough for any extras. Maybe Ruth won’t be upset if I share another page that has really helped me. Try The Prudent Homemaker. Between her and readers comments I have really learned a lot of ways to cut expenses. Of course, I can’t get out and tend a garden, but there sore so many ideas. I wish you the best of luck. It sounds like things are really tough for you right now, and I’m so sorry. While the challenge might be a little different for you, since you have already cut back as much as possible, I think you might still find some fun ideas of things you can do and get for free that you might find encouraging! The challenge is different for everyone, and so while not everything may apply perfectly to your situation, I think you might have fun applying some of the ideas! Can you work from home to earn extra $ perhaps? Try selling a craft or doing bookkeeping for someone. There are sites that you can sign up for to do online surveys. It’s pretty great! Just google “online surveys to make money”. Good luck! I did this quarterly last year and was able to set up my emergency fund and take a cruise vacation on the money I saved. I’m on social security and was able to do this. I’m excited to do it again because I’ve gotten away from it a little this year so it will be great to get back into this wonderful plan. I started reading your blog a few years ago when I was a stay-at-home mom and we did the “no spend” challenge! Now that I’ve been working and we have extra income, we’ve fallen away from watching our spending so strictly. So, I already had on my calendar to start another “no-spend” plan this fall and I’m so excited to sign up and get your new ideas emailed each day! Looking forward to October! And I was just reminded that it’s your freezer meal plans I’ve been using! I used plans #1-6 and, joined by some friends, we made them all in one day! So my freezer is stocked for a “no spend” challenge. I’m super excited to start this! My teenagers…not so much!! Will we start getting emails on October 1st telling us what to do? Definitely going to be a challenge! This is a great time for this challenge because Fall is so expensive with school fees, sport fees an so on. I’m excited to really see where my wasting is going! Can I start this now (mid-September) I’m flying to a reunion in Michigan the 22nd of October (pre-planned months ago) and obviously will be spending a little bit during this 6 day trip. Thanks for your input. I’m in…this actually sounds like it could be fun…eye-opening at the least. I signed up twice and I still haven’t received the confirmation email. How long does it usually take? Thanks! Could be in your junk or spam mail. I went to buy the Kindle version on Amazon and all I see is the paperback – do you know when the Kindle version will be available? I hope before October lol since I won’t be spending any money that month! I’m really excited to give this a try and hope to make it a quarterly adventure! Thank you for these tools! Feeling like I need to hit the reset button in so many ways. Have been in a funk for many weeks now – trying some different meds/foods/attitude adjustments and just can’t get it back on track. I find what you say in your book about the parallel btwn finances and life tends to ring true in our home. Will be putting on the big girl pants next month and looking forward to it! Also enjoying your full audio book as I drive to work each morning. Our mutual friend LeeAnn shared the written preview copy with me and I was hooked. Thank you for sharing your heart, your passion and your story for others benefit. What is the name of the audio book? I probably won’t be able to freeze the spending starting October 1st, because we are moving to Botswana, Africa with 4 totes, 2 carry-on bags, a purse, and a computer bag. We’ll be starting over, the middle of September. No pantry, freezer, etc. to use for meals. However, I AM excited to get the emails and implement the challenges as I can. I signed up, and I’m super-excited to get started. I was just the maid of honor in a wedding, and it wound up costing me so much money, that I really need to get my spending back on track. Also, I live in Silicon Valley, where more than half my income goes to rent (according to the budget tool above, I should be paying $1,000 less a month in rent! Yikes!) I’m trying to save up to build a tiny house for me and my daughter, and I think this can help us get in the habit. I can’t wait to start! I am signing up! I had a rough several years and let my finances get ahead of me and am hopeful I can get back on track. Thank you for putting this together. I have looked into building a tiny house too! My husband left me and my daughter and so I need to think about my financial future and plan wisely. Have you found a city in Southern California where you can legally live in a tiny house? Are you buying a plot of land and putting the tiny house on it? That is what I have considered but different cities have different housing codes for what is legally OK. When you say tiny house do you mean just a house that is small or do you mean an actual “tiny house “? Would love to hear more about this! HI, I am very excited and I want to do this challenge. My husband and I eat strict low carb. I cannot in any way store enough meat, eggs, and frozen veggies in my fridge and pantry for an entire month. Our daughter , husband and their three kids live with us and we share a fridge and pantry . So, I have to spend about 300 on our personal food over the month. They buy thier food seperately. I can buy every two weeks and fit that in barely , but I cannot put the amount of food for a month away and we are currently using what is in the house right now, so I expect there to not be much end of the month. What we have is older frozen meat and I want to get it all eaten soon. So, if we break it down to every other week, and spend the 150, can that still qualify if we do not buy a single thing not on the list ? It is a very short list so easy to get in and out of the store. I see the Kindle version now but it’s only readable on a computer? I want to buy this for my Kindle reader – will this be an option soon? I have a question for the Veteran Zero Spenders: I would really like to try this but based on previous conversations I can predict how my spouse will respond and he won’t want to participate. Has anyone had any success convincing a reluctant spouse or even just doing what they can individually to reduce spending? First thing you have to do is erase any “predictions” on how he will react from your mind. What happens is YOU believe the conversation is going to go a certain way (most likely negative) and you project that into the situation. Do you see how unsure and nervous that sounds? He will hear that and think that if you aren’t excited why should he be. Right? Instead show your unwavering enthusiasm and make it about both of you. “Babe remember we talked about how we wanted to (insert topic here). Well I just saw this GREAT challenge that I’m really excited about that’s going to help us (talk about the benefits here). Here is where normally someone would give an ultimatum or a yes/no question. DONT do that! Instead you can better your odds by giving him slightly skewed questions. Wouldn’t you like to (ex. “have more home cooked meals so that (benefits)”)…..
you can use anything you want but they must be questions he can’t refuse and it must relate to the challenge. Wouldn’t you like (ex. “to finally get rid of some of the clutter around here so that (benefits)”)…. Ask 2 or three of these “Can’t Say No” questions then hit him with this. That sounds kind of manipulating. Skewing questions to get what you want, even if it’s a “good thing” that u want doesn’t end up being a “good thing” because it wasn’t in unity. Saving money at the risk of being manipulative isn’t worth it. Full honesty and honoring someone’s choices is always a good thing. Do you do this at another time? I would love to give this a try, but we have a two week scheduled vacation and that makes not spending impossible! I am excited to try this for the first time and signed up. However, October is when our anniversary is and we have a couple family celebratory events (birthdays, etc.) Is it okay to freeze as much spending as possible with the plan but still accommodate the events already on the calendar? I just started reading your book and am so looking forward to using this as I read through the book. Thank you so much. You will need to download the file (which happens automatically when you click on the link) Then once it is downloaded, find the location it downloaded to. I started the spending challenge today. Well it’s grocery shopping day my weekly budget for a family of 6 is $250 a week for food and anything else we need ( dog food, guinea pig supplies). I made my menu for the week taking into account my pantry and freezer. I spent $84.82! For the whole week!!!! Needless to say I was ecstatic about it. Next week will be a different story but I save a lot of money this week! Woohoo! I am on day 3 of no spending. There are so many reasons I need to save money. My goal with saving this month is to pay off my credit card at the end of the month and my wedding dress. I went from being a teacher’s assistant to finally getting a teaching position in August. I thought with the increased income, I would finally be putting money into savings, paying credit card bills off (these racked up while bringing home $600 per month as a teacher’s assistant), saving for my upcoming wedding, and for a new car that I know I’ll need in the next couple years. However, having more money just ending up meaning there was more money to spend. I went from a job 20mins from my house to one that’s a 55min drive one way. That tripled my gas budget. Plus, I’m a giver, I love buying gifts for other people and for the first time I was able to buy everyone something for Christmas. I don’t regret buying the gifts that I did, I do regret not managing my money to do it. So, here it is January 2016 and I have nothing in my savings account, still about $1600 in credit card debit, no money saved for a car and nothing really saved for my wedding. I’m praying this 31 day challenge puts be in a place to pay off those credit card bills, so that I can start applying that money towards other bills, savings, and more necessary things. I am very sad because we began the 31 day challenge in January with the free content and a few days in it was no longer available and now you have to buy the book to finish. Well it is NO SPEND JANUARY so how can I buy the book. I am very disappointed.